Hyphen and The Asian American Writers’ Workshop have selected the 2010 Asian American Short Story Contest winner, Sunil Yapa, who penned “Pilgrims (What is Lost and You Cannot Regain)”, a poignant story of anguish and reconciliation. Yapa is a recent graduate from the MFA program at Hunter College in New York City. His work has appeared in Pindeldyboz: Stories that Defy Classification and The Multicultural Review, and he has received scholarships to the New York State Summer Writers Institute, the Bread Loaf Writers’ Conference and The Norman Mailer Writers Colony in Provincetown, MA. The son of a Sri Lankan father and a mother from Montana, Yapa grew up in central Pennsylvania and has since traveled and lived in 48 states and 35 countries. Contest finalists included Viet Dinh for “Lucky Dragon,” Soma Mei Sheng Frazier for “Antique,” Marjan Kamali for “Tehran Party,” Stellar Kim for “Dissolution,” Tsering Lama for “The Greatest Tibetan Ever Born,” Jenie Pak for “Something Out There,” JK Shushtari for “The Sweet Dry Fruit of the Lotus Tree,” Shilpi Suneja for “The Simpleton,” and Shruti Swamy for “Blindness.” Alexander Chee, Whiting Awardwinning author of Edinburgh, and Jaed Coffin, author of the memoir A Chant to Soothe Wild Elephants, served as judges, and Fiction Writers Review was proud to serve as a media partner for the contest. Yapa’s winning story will be published in the fall issue of Hyphen, on newstands in September. Until then, you can whet your appetite by reading the 2008 winning story, “Playing the Sheik,” by Shivani Manghnani, and the 2007 winning story, “Our House Stands in a City of Flowers,” by FWR contributor Preeta Samarasan. Finally, you can read more about the contest and results on the AAWW website and the Hyphen website. 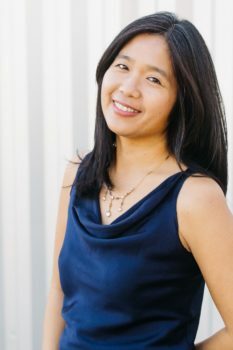 Celeste Ng is the author of the novels Everything I Never Told You (2014) and Little Fires Everywhere (2017). She earned an MFA from the University of Michigan (now the Helen Zell Writers’ Program at the University of Michigan), where she won the Hopwood Award. Her fiction and essays have appeared in One Story, TriQuarterly, Bellevue Literary Review, the Kenyon Review Online, and elsewhere. She is the recipient of the Pushcart Prize, the Massachusetts Book Award, the American Library Association’s Alex Award, and a fellowship from the National Endowment for the Arts. She lives in Cambridge, Massachusetts.